Brown & Beattie Ltd. (est. 1998) is a building science engineering firm that provides a diverse range of engineering services. We work with building owners, condominium corporations, property management firms and the insurance industry. We specialize in all aspects of building evaluation services. We offer a full range of consulting engineering services to Condominium Corporations and operate as YOUR engineering staff. Services include reserve fund studies and performance audits. Davroc is a Canadian-owned consulting engineering firm providing a full range of services in connection with the assessment, maintenance and rehabilitation of buildings and structures. M & E Engineering specializes in Reserve Fund Studies, Energy Audits, Boiler & Chiller Designs, Kitec and Domestic Piping Replacement, Emergency Generators, Fuel Systems, Project Management, Power & Lighting Design, Fire Protection and Fire Plan Update. McIntosh Perry is an engineering company specializing in reserve fund studies, mould and asbestos surveys and project management for repairs to the building envelope, including balconies, walls and parking garages. 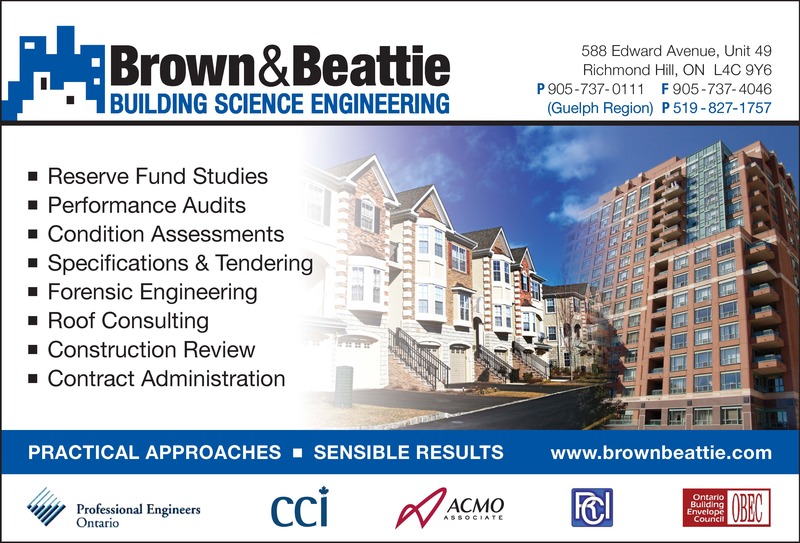 Peto MacCallum Ltd. provides Building Science consulting services including Building Envelope retrofit, investigations, recommendations and Contract Administration, Roof Assessments, Reserve Fund Studies and Parking Garages Rehabilitation.